When children are small, particularly in the first year of their lives, their immune systems are immature and they often suffer from coughs and colds. They haven’t yet built up the immunity to fight off all the viruses that cause these infections. Babies and toddlers may come down with as many as eight colds a year and those who attend daycare may suffer even more. They are always exploring so they can easily pick up viruses by touching contaminated surfaces or being exposed to infected persons. Over the counter medications are unsafe for young children and they can have serious – even fatal – side effects. Gentle, safe home remedies are readily available and offer a viable alternative to these medications. These home remedies do not shorten the length of the illness but they will help the child to cope with symptoms such as a runny nose, a low-grade fever, coughing, sneezing, irritability, difficulty sleeping and loss of appetite. When a child has an elevated temperature, it’s a sure sign that the immune system is working to fend off a virus. It is often difficult to know when you need to call the doctor. If a baby is under 3 months and has a fever, you shouldn’t hesitate to make the call. Other situations where a visit to the doctor might be necessary are when a child has a very high fever or when symptoms persist for a long time. 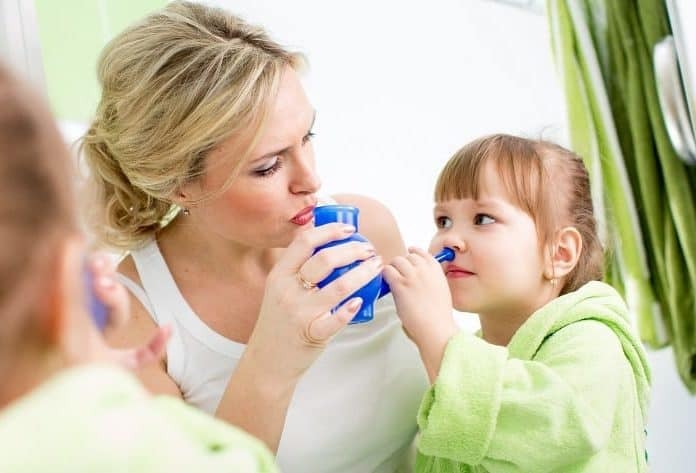 In many cases, home remedies can deal effectively with the symptoms and keep a child as comfortable as possible until a cough or cold gets better. Fighting off an infection like a cough or cold takes energy. Your child needs to rest to give the body time to heal. Studies have also shown that children who are under stress or pressure are more subject to illness and giving them a break and a rest may be exactly what they need. Most children are only too ready to go to bed when they feel ill. There is probably no other time when they might just fall asleep in the middle of the day. Your child does not necessarily need to stay in bed and may prefer a snug spot on a couch or a tent in the living room where they can be close to you. It’s when a child starts feeling a little better that it becomes more difficult to get them to rest. This is when they need something to keep them occupied like some favorite videos, an entertaining app or even a new coloring book and crayons. If you have time to read to your child, tell stories or play games this can help to pass the time and make sure that they don’t start being too active too quickly when they start feeling better. It is not fair to send a sick child to school or to daycare where they can infect others. Children often become clingy when they are sick but the minute they are feeling better, this passes. They usually get well quite quickly if they are suffering from a common cold or a cough and it’s usually not necessary to pay a visit to the doctor.